What We Can All Learn From Muhammad Ali? 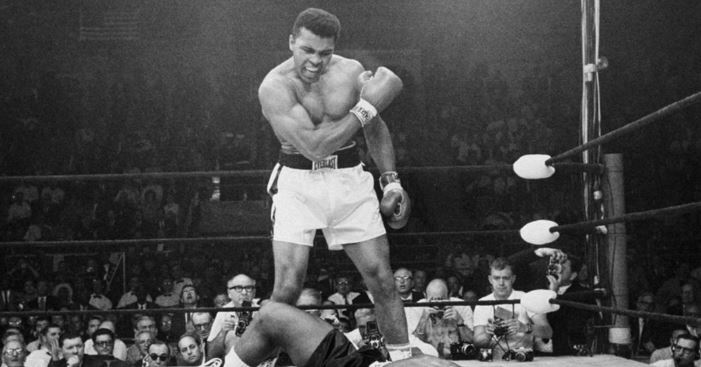 Muhammad Ali is regarded by most people as the greatest boxer to ever walk this earth and for good reason. With 61 fights under his belt, this heavyweight champion of the world won 56 of them, 37 by knock out with only 5 losses. This is an impressive record any way you cut it and together with his philanthropy, is why he is so highly rated. His most famous fight in the historic bout where he went toe to toe with George Foreman in Congo; which is why it was called the Rumble in the Jungle. He won that fight in the eighth round where he floored the previously undefeated champion of the world, in what is viewed by many as “arguably the greatest sporting event of the 20th century”. This was also where Ali introduced his world famous Rope-a-dope technique to the world. In his life, and especially in the ring, he is someone who has massive confidence including claiming he was the greatest following his first official fight for the world title. He had so much flair and skill that he was not afraid to show to the world. He coupled this with great character and so much sportsmanship that he is said to be one of the greatest sportsmen who ever walked the earth. He is incontrovertible proof that believing in yourself and in your abilities can greatly improve your performance in the ring and in other areas of your life as well. Think positive: It all begins with the mindset that you can do it. Believing that you are capable of achieving something is actually half the battle most of the time. With a positive attitude, you are able to push yourself harder in training and have better gains in the gym. Set goals: Making a list of what you want to do and putting it within a certain timeline gives you focus and motivation to tick them off the list. This is why you should make both long term and short term goals, and stick to achieving them religiously. Strive to be prepared: Practice and preparation are the driving forces of achievement and help you keep self-doubt away. There is a reason why they say practice makes perfect; it will make you a better athlete and enhance your abilities. Experiment with a confidence wall: A confidence wall is where you write down all your positive qualities and achievements and revisit them every morning to remind yourself that you are awesome. This will greatly enhance your belief in your ability. You have to consistently train even when you feel like you do not have the motivation to anymore. The great Ali said, “The fight is won or lost far away from the witnesses; behind the lines, in the gym and out on the road, long before I dance under those lights”. This is actually true for every aspect of your life. The better prepared you are, whether in the gym for a fight or in life for a job interview for instance, the better you are likely to do. Preparation makes everything easier to do and especially if you have a solid team of trainers and partners. This is something that does not factor in talent and can be done by anyone, whether for a professional or an amateur bout. It is important that you stand for what you believe in. Ali is famous for refusing to honour the draft for the war in Vietnam. This is something that caused a public outcry in the country since it was seen as being unpatriotic. This something that was unheard of from someone who was a public figure, in what was a hot streak. He had sustained victories over Cooper, Patterson, and Terrell among others. Standing for what you believe in not only inspires confidence in you but also in your abilities and function. It becomes the foundation to build your boxing on, which in most cases is unshakable, and makes you more determined to succeed. In most cases, you will even become an inspiration to the rest of your team.